Skills and abilities: A prodigious street fighter and natural brawler. He was almost single-handedly able to raise the notoriety of Turk a wannabe kingpin and even Wilson Fisk’s rise to power by just his presence in his crew. He was pulled into a life of crime by his older brother Aaron when he accompanied his brother to a drop. It went south and he found himself arrested. Bailed out by Nicholas Fury he was offered a job with SHEILD. After a heated debate with his mother he found himself recruited by Turk as his muscle, he also reunited with his brother Aaron. Fury reveals that he needs a double agent so that when Turk’s organization is bought out by Wilson Fisk and he becomes Fisk’s weapon SHEILD will have the Intel they need to stop a potential international incident (Miles Morales- Ultimate Spider man #8). As Wilson Fisk transitioned into the Kingpin of Crime Jefferson was part of his very tight inner circle. He tried to get Nicholas Fury to stop Fisk but he refused because they needed more Intel. Upon meeting with Toad who was selling mutant growth hormone and the mutant to supply it. Right then Fury showed up and shut things down. Fisk and his crew were arrested and Jefferson was offered a chance to become a real SHEILD agent but he declined. 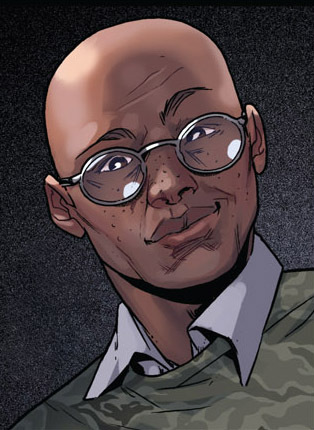 A week later while at physical therapist office he saw Rio Morales and she knocked him out, she changed him by just looking at him, (Miles Morales- Ultimate Spider man #9). During the “United we Stand” storyline he is wrongfully incarcerated by Shield and is rescued by Hydra. When the agents killed a man in front of him he was traumatized and shot them and ran off. This ordeal still haunts him.